If you have an Unlimited Plan, you can download activities to play offline! What should you do if your device runs out of space? We suggest keeping your child's favorite games and videos downloaded. Each week, Lingokids features a weekly topic for your child to learn new vocabulary about different themes in English. While exploring the app at the beginning of the week, download activities that are new and interesting for your child so that they can play them offline! Then at the end of the week, delete your downloads and find new favorite activities. How do I download an activity? When you are still using an internet connection, you can download the activities you want to play offline. Each activity has an arrow on the top right to download. Tap this feature to download the activity. You can use the small arrow download icon that appears in each activity. You can play downloaded games without internet connection. Only the activities you have downloaded will appear in kid's mode. Once you have downloaded the activities you want to play offline, disconnect your device from internet. When your child plays in kids mode, only the activities you have downloaded for offline use will appear. You can use this methodology if there are specific activities you would like your child to play with. Want to make more space on your device? 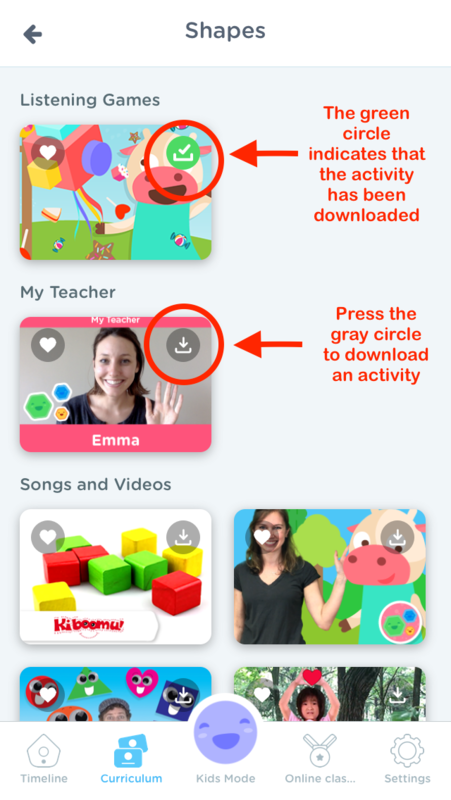 Or download new activities for your child to practice?Simply navigate to settings. From there, press "Delete downloads." These activities will no longer be downloaded on your device. If you have any questions about downloading content for use offline, send us an email to hello@lingokids.com.